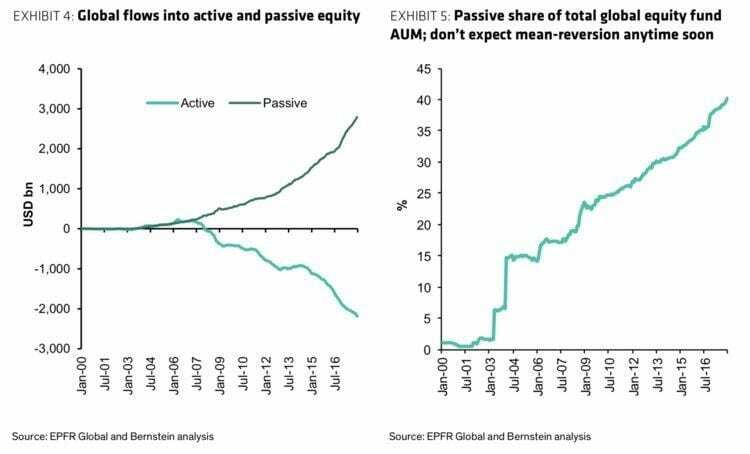 Passive equity investment vehicles such as stock market index funds have exploded in popularity over the last decade. In fact, as of this year there are now more index funds than there are actual public equities, a remarkable shift that has shown no sign of losing momentum (Bloomberg News, 2017). Over the last 10 years alone, nearly $5 trillion (Sweta, 2018)has flowed out of actively managed funds and into such passive funds. This transition means that globally more than 40% of assets under management are now in passive investment vehicles (Sweta, 2018). However, the rise of ETF and index funds has raised serious questions surrounding passive investment ownership and its growing allocation to the REIT sector. Passive investment vehicles have gained popularity for a number of reasons. First, they offer a relatively stable high dividend yield and a strong risk adjusted return profile versus many other asset investable asset classes. Second, they are low-cost alternative investment vehicles that often only incur five to twelve basis points in fees. Third, they are an efficient and liquid way for investors to deploy capital. An additional factor that drives capital flows into passive real estate funds is the notion that real estate is often seen as a non-traditional asset class. Real estate has its own industry jargon and technical skillset. Evaluating and comparing REITs often requires an understanding of the language and complexities specific to real estate and can sometimes be fundamentally different than the comprehension that is needed to analyze GAAP financial statements from non-real estate Fortune 500 companies. Retail investors and active managers seeking exposure to real estate are often unfamiliar with these intricacies involved in evaluating real estate firms, and thus they often prefer to instead allocate funds to passive vehicles like a diversified REIT ETF. Rather than assuming the risk of investing in an unfamiliar REIT, investors use these funds to track broad market REIT performance or to select specific portfolio weighting for different real estate asset classes. For example, an investor could over allocate to hotel or self-storage ETFs to add specific risk exposure in an investment portfolio. As passive funds experience rapid growth, REITs continue to evolve into institutional-quality investments. Today there are 189 REITs traded on the New York Stock Exchange, with a total market cap of over $1 trillion, roughly equivalent to the GDP of Norway, Austria, and Hong Kong combined (GCP Country Economy, 2018). The institutional capital that flows into REIT equities is largely from passive index tracking funds like the $60 billion AUM Vanguard Real Estate ETF (NYSE: VNQ.IV). Each dollar committed to these funds is allocated across a market cap weighted portfolio of REITs. This gives investors diversification benefits and exposure to broad market REIT returns. However, of the most popular stocks owned by ETFs, eight out of ten are REITs (Colson, 2017). Active REIT investors find this asymmetry concerning as they fear a dislocation between REIT net asset values driven by real estate prices and REIT values being raised artificially by rules-driven investors bidding up ETF share prices. Further, ETFs are not known to engage in proxy fights, nor do they attempt to actively work to implement new ideas alongside REIT management. The flow of capital into REITs from rules-based investors could take pressure off of REIT managers to attract capital by driving operational performance, but this phenomenon might also allow for the potential of less discipline. Questions are now being asked about what happens when these investment vehicles begin to acquire majority interests in individual REITs. How will management teams at REITs respond? Today, Tanger Outlets (NYSE: SKT) is the REIT most owned by ETFs at a 31.5% presence in ETFs and a passive ownership interest of 46.9% (Colson, 2017). Analysis shows that active investors continue to drive price changes in Tanger Outlets, but if liquidity dries up, this may not be sustainable long-term. The long-term effects that passive ownership will have on the discipline of REIT management teams is still unknown. In theory, if active investors raise share prices of a REIT by bidding up share prices, then rules-based passive investors would have to purchase additional shares to maintain balance in their portfolios (Murphy, 2018). In a sell-off, the opposite would also be true. The resulting magnification of performance as passive vehicles rebalance their allocations has the potential to increase the volatility of REIT securities. With so much buying power, active managers looking to increase or sell positions in passively owned entities risk potentially being trapped without liquidity when they seek to trade. Increased volatility could even tempt some market participants to increase their speculative positions in REITs looking for arbitrage opportunities, resulting in some larger issues that potentially undermine the stability and liquidity that REITs were designed to deliver in the first place.